This robotic falcon bird was developed by Clear Flight Solutions, and is truly a unique remotely controlled robotic bird of prey, with the realistic appearance of weight of its living counterpart. Known as the 'Robird', the robot uses flapping wings as a means of propulsion, with a flight performance comparable to an actual bird. Taking inspiration from nature itself, the Robird offers new and exciting possibilities in bird control at any airport. By triggering the instincts of a bird through the combination of silhouette and wing movement, the robotic bird will chase off unwanted birds, making sure that none of these birds get sucked into the engines of any aeroplane. There is always someone controlling the bird, so almost like a drone. The company has developed two types of Robird: the falcon, which can be used to chase off birds up to 3kg; and the eagle, to chase away any type of bird. 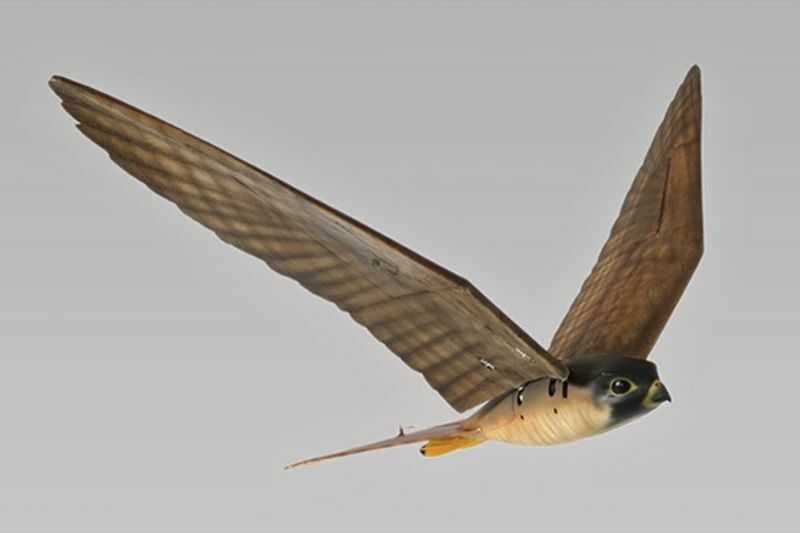 The peregrine falcon robot has a wingspan of 120cm or 47inches and reaches speeds of 80km/h.